Your 10 month old baby is becoming increasingly expressive, and might be displaying clear personality traits such as being quiet and calm, or lively and boisterous. They’ll be experiencing a variety of feelings every day and may be easily upset, giving you the difficult task of dealing with baby mood swings. As well as those first baby tantrums, let’s look at what else you can expect from your ten month old. Don’t forget that these are development milestones for the average ten month old baby, and they could come earlier or later for your little one. You can expect a 10 month baby weight to be anything from around 7.5 – 11.2kg for boys and 6.8 – 10.7kg for girls, and for them to measure between 66.8 – 77.6cm. The best indicator of what is normal for your baby is the curve on their personal growth chart – any high or low anomalies should be checked with your doctor. You might find that the time is right to drop your baby’s morning nap. If baby is fussing a lot at bedtime, and not sleeping as well at night as they were previously, these are signs that they only need one nap during the day. Your baby is far more alert and active than when you were charting those early 10 week old baby milestones! Most babies will have several teeth by now. If you’ve been weaning your baby the traditional way (with pureed and mashed foods) you might feel comfortable trying him with finger foods. Ideas for 10 month old baby food include soft meats and fish, beans and legumes, hard-boiled egg yolks, cheese (pasteurized), bread, rice cakes, steamed veg and soft fruits. As always, when trying your baby with different foods, keep a careful eye out for any signs of an allergic reaction. Your baby will become increasingly mobile over the next few months, as he builds up to taking his first steps. Most babies will be able to get into a sitting position from lying on their stomach, crawl well, pull themselves to a standing position, stand when holding something and cruise around the furniture. Some ten month old babies will be able to stand alone for a few seconds! Most babies will have mastered the pincer grip, and they might enjoy using a spoon to feed themselves baby rice or yoghurt. Some will also be able to drink from a sippy cup, unaided. Stacking cups and games that involve putting a small item into a larger one will delight your baby at this age, as he figures out what fits where. Some babies will have the skill and dexterity to hold a toy in one hand, while using the other to do something else – becoming adept at multi-tasking at just ten months old! Your baby will be trying hard to communicate with you and others around him, both verbally and non-verbally. Over half of all ten month old babies will be able to identify the right people as ‘mama’ and ‘dada’, but don’t worry if they’re still switching the names between both for now. Babbling is your baby’s language of choice, but do engage them in pretend conversation to encourage them to continue trying to form words. Learning toys will also be useful at this stage, to help teach baby about letters, colors, shapes and numbers. Some ten month olds will be able to understand some simple words and one-step commands (i.e. pass the ball), so it’s not too early to introduce them to the words ‘yes and no’. Setting firm boundaries now will help keep your baby safe and provide security. Your baby might also use non-verbal gestures such as pointing to communicate their needs. And most will have learned to wave goodbye when someone leaves. 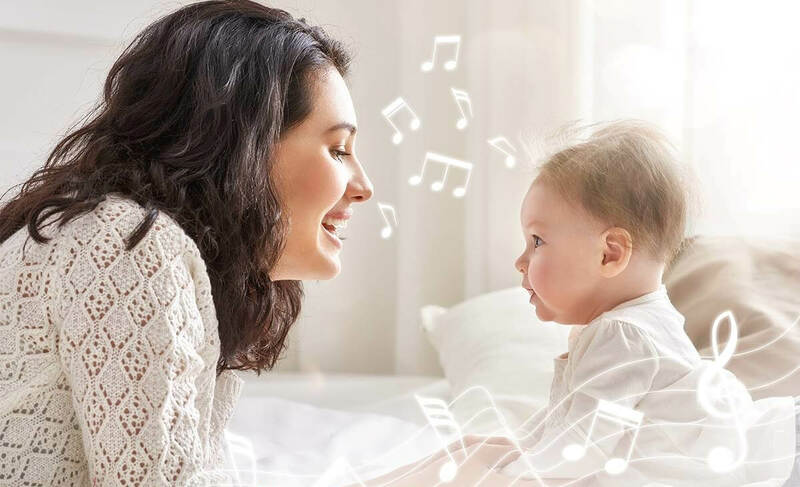 There are lots of claims as to why listening to music is beneficial to babies – from making baby smarter to improving creativity. While these claims can’t be proven with certainty, it’s safe to say that many babies love listening to music, so encourage them by playing different types of music and providing some musical toys. By ten months a baby should have excellent depth perception, and will be able to throw something with reasonable accuracy. Games like peek-a-boo will help to develop your baby’s visual memory. You should also book baby in for an eye exam between the age of 6 months and one year, to check that everything is functioning normally. Soft toys and toys with different textures will continue to delight your baby’s sense of touch, so try to provide him with a good variety of safe objects to play with. As your baby develops their understanding of which toys belong to them, they might decide that they no longer want to share with any other visiting babies or siblings. At such a young age, the concept of sharing will be beyond your baby’s grasp, but they will react to your approval or disapproval, so you can gently encourage them to share and take turns with lots of positive praise while playing. Your baby is also becoming a little mimic, watching what you do and trying to copy. You might catch them picking up a hairbrush or your phone and putting it to their head! As your baby’s personality starts to shine through, you might find that they’re becoming increasingly sociable and smiling at everyone. Remember that it’s normal for babies of this age to be shy around strangers – it doesn’t mean that they’ll be shy when they’re older.